Harajuku girls in vintage clothing fashion styles with fuzzy coat dress over camisole, low heeled pumps, ribbed sweater, tiered ruffle skirt, tassel socks, white sneakers and sling bags. 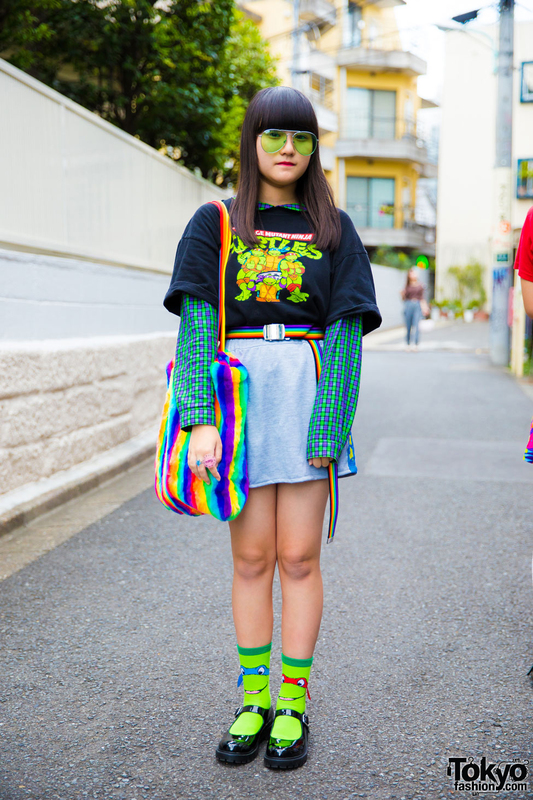 Harajuku student in Teenage Mutant Ninja Turtles themed outfit with t-shirt over plaid shirt, remake skirt, patent baby doll shoes, a fuzzy rainbow tote bag, green sunglasses and cute rings. Bunka Fashion College student in feminine pink and white fashion wearing a lace camisole over an off the shoulder long sleeve top, polka dot skirt, bow socks, cute heels and accessories. 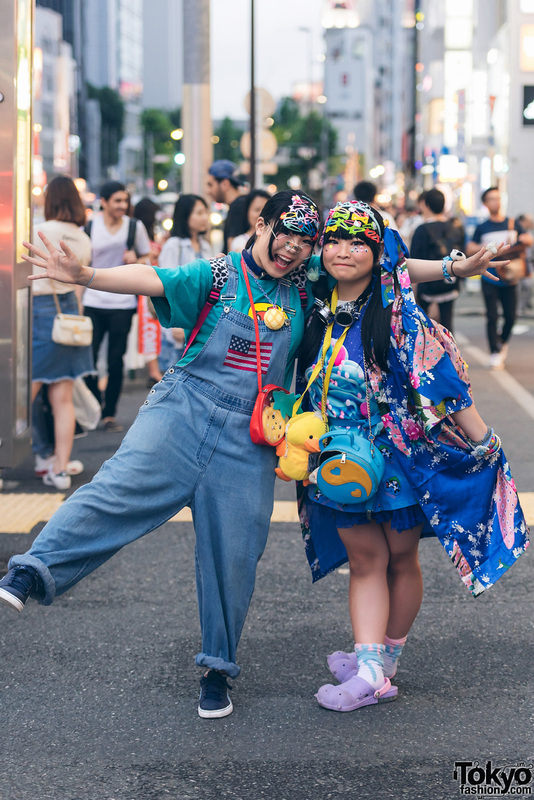 Harajuku girls in blue colored street styles wearing denim overalls, kimono coat, t-shirts, ruffle skirt, sneakers, rubber sandals, backpacks, sling bags & decora accessories. Harajuku trio in bob hairstyles with minimalist monochrome fashion. 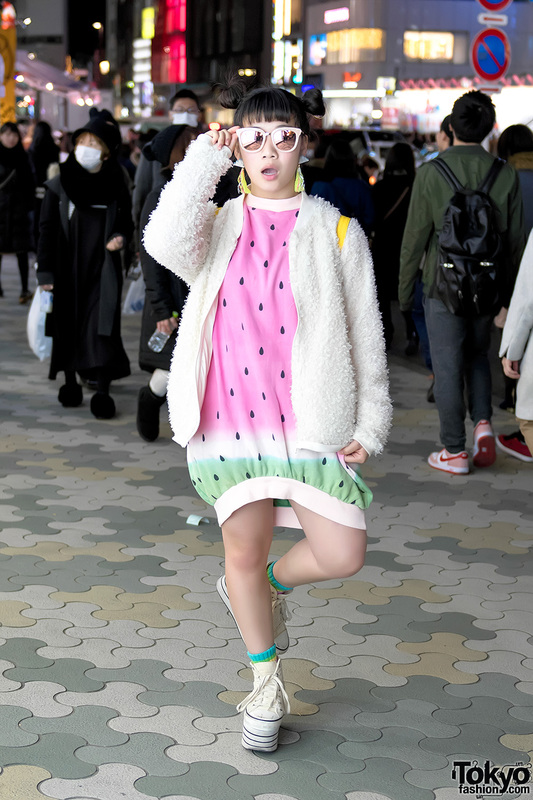 Japanese dancer on the street in Harajuku wearing a watermelon print dress and watermelon socks, platform sneakers, and a fuzzy sweater. Harajuku Monster Girl with blue hair wearing a “RICH” jacket over a Mr. T tee, skirt, and platform booties with doll heads inside. 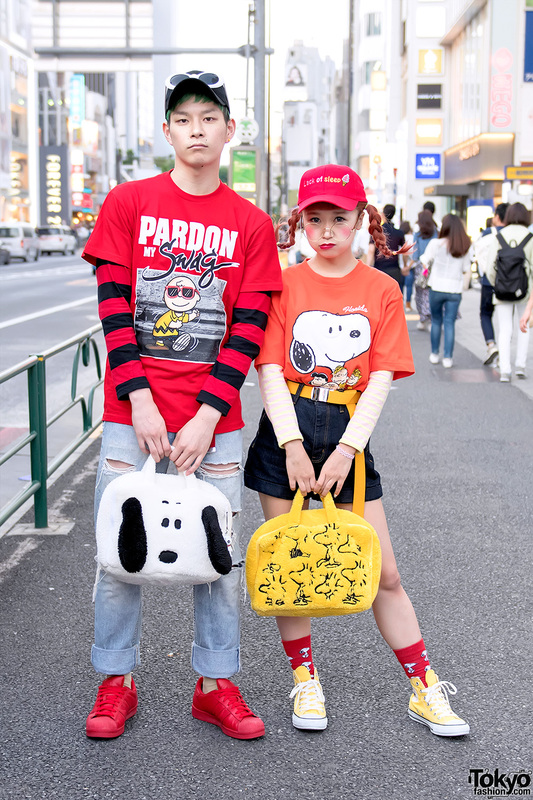 Hikapu and Daichi wearing cute fashion featuring Snoopy, Charlie Brown, and Woodstock on the street in Harajuku.